The MCC Laws of Cricket are adopted at all levels of the game. This is the official rule book. 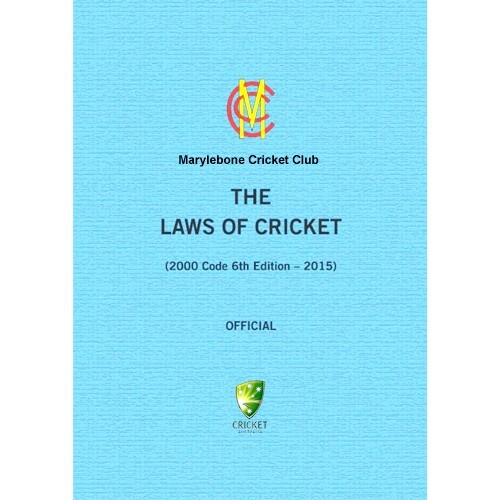 Among the changes in this new 6th edition – effective from 1st October 2015 – are:Founded in 1787, Marylebone Cricket Club is the most active and famous cricket club in the world and owner of Lord's Cricket Ground - the Home of Cricket. - Law 41.7 which will now allow fielders to move in reaction to the shot that the striker is playing. For instance, slip will now be able to move towards leg-slip as a batsman starts to play a fine sweep. Thus ‘intelligent’ movement in response to the actions of the batsman will be allowed, whilst ‘deceptive’ movement, such as running backwards before the ball is released will continue to be prohibited. - Law 40.4 which will now allow the wicket-keeper to move in a similar way, provided that he remains behind the stumps, but will no longer allow him to move laterally before the ball is delivered, nor allow him to move up a couple of paces to within reach of the stumps in response to a slower delivery.